This is maybe the third or fourth time I've read this book. It is an incredible book, by any standard. Historically authentic, the author takes you beyond the facts into the world that Kleopatra inhabited. The book chronicles her life from a child up to when she assumed the crown at the age of nineteen. It is a heady, intoxicating drama which draws you in and refuses to let go. It is the quintessential page-turner. When you read it, you feel as if you are truly in Alexandria or on a royal barge travelling up and down the Nile. The imagery that the author draws is impeccable, the words she chooses are perfect. For a debut novel, this is magnificent. There is a sequel called Pharoah, which picks up where the first book leaves off. 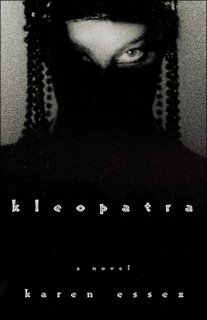 It is in this book that you'll find most of the imagery that is most frequently associated with Kleopatra; her marriage to Marcus Antonious, her meetings, courtship and subsequent marriage to Julius Ceasar (including the infamous rug scene) and the ending that pretty much everyone is familiar with. The sequel is a good book in its own right, but somehow I keep coming back to the first one, Kleopatra. There's something about this book that really appeals to me. Conclusion: A must read... over and over and over again. I'm reading Dispatches from the Edge by CNN Anchorman Anderson Cooper. The book is very gripping so far. I like his writing style. Its very fluid and symmetrical. I like how he hops back and forth through his life, from his beginnings as an anchorman to his childhood to his present-day assignments covering everything from wars to natural disasters. It is as if he is unstuck in time. I had an odd thought though while I was reading the book. I was at a part where he discusses his experience covering the tsunami and all the disasters that followed. And I couldn't help but think. Hundreds of thousands of years ago, Mother Earth ruled her domain unequivocally. Human beings were insignificant in the grand scheme of things. As far as Earth was concerned, we were not a threat. Now, global population is at what 6 billion or something, up from maybe half a million at the start. Humans are very much a threat to Earth at this point. Perhaps that is the true reason natural disasters seem to be occurring much more frequently and much more dramatically than ever before. Its because, very much like a parasite, human beings are leeches; sucking and draining the Earth of everything she has. Taking, taking and never giving. The status quo has been forever altered. Perhaps these natural disasters are Earth's way of defending herself. All I know for sure is that no species, no matter how dominant, can take on an entire planet. If there is one thing that remains elusive and, in fact, indifferent to human progress, it is the weather. We can't control it, we will never be able to control it. One of these days, Earth is gonna blow her top... and my only hope is that I am already dead by then. i've had a focused genre reading in the past few months.. i definitely needed a recommendation thats a bit biblo and a bit historical.. thanks. where to pick it from? in kuwait.. or order?